-Notes of encouragement to the Troops!!! -Dog boots (see items page for brand and link). We are also in need of a few things at this time: twizzlers, microwave foods(popcorn, mac and cheese), instant coffee, peanut butter and hand sanitizer. Travel size items are always welcome because they are easy to carry. No items in glass, please. This list changes weekly and we always welcome anything from the full list on the ‘Items Needed’ page. 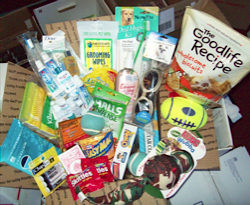 You are currently browsing the TroopDogs blog archives for August, 2013.